This month I have been reading the first of a massive pile of Christmas books which should keep me busy this year. 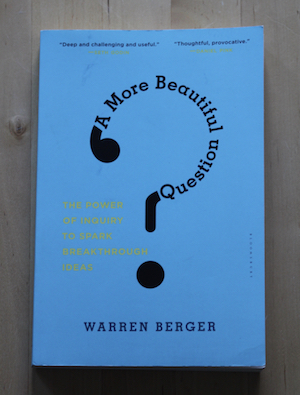 A More Beautiful Question by Warren Berger is a fascinating read all about how to ask better questions and why we should bother. As someone needing to ask questions in my work to find out what my users think and what problems I should be trying to solve, I thought this book might help me to form better questions, but it actually does much more than that. This is an inspiring book that does not just look at how we can ask better questions but why it is important to do so. Berger also talks about why businesses need to get better at questioning or more importantly allowing their employees to ask questions and finishes by asking why we do not give ourselves space to ask more questions of ourselves. While he does talk about how you can make questions open or closed and other technical things I found the parts about what happens when you ask a good question much more interesting. For instance I already knew that thinking about a problem and then doing something else, like going for a run, helps me find an answer, but I found the suggestion to ask yourself an actual question about that problem and how it makes it easier for the brain to come up with a solution intriguing. If you want to ask better questions this is a great starting point, but if you are just curious or creative I think you will find this book inspiring too. It is definitely going to change the way I approach asking questions, although I think it will take a bit of practice to get to a point where my questions are beautiful.